Archaeologic Memotech liked to advertise its MTX 500 and 512 microcomputers with a picture of a speeding black Porsche, but the machines, which made their first public appearance 30 years ago this month, while undoubtedly quick off the mark soon slammed hard into an unforeseen wall thrown up by a sudden, severe change in market conditions. Announced in June 1983 at the Earl’s Court Computer Fair and at the height of the UK home computer boom, the MTX almost immediately won plaudits for its build quality, performance, capacity and all the functionality its developers had crammed in. 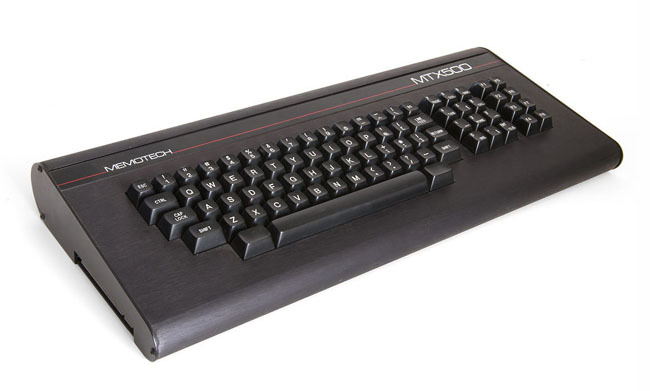 Only slightly more expensive than a Sinclair ZX Spectrum, the MTX nonetheless had a spec to match that of the BBC Model B. It ought to have been of one the defining micros of the third generation of British home computers, but the near-complete collapse in demand after Christmas 1983 which killed the likes of Dragon Data, Camputers and others, would prevent it ever realising its full potential. Memotech was the brainchild of two Oxford boffins: a mathematician and a metallurgist, Robert Branton and Geoff Boyd. During the mid-1970s, Boyd studied for his PhD in Oxford University’s Department of Metallurgy. There he’d had to design electronic circuits for lab work, and quickly discovered he was a rather dab hand at it. Becoming something of an electronics enthusiast, he was soon building audio kit at home. Around 1977, Boyd met Branton, who was then working within Oxford’s programming research group. Boyd recalls encountering his soon-to-be business partner at a ‘crammers’ session in which the two, and others, were giving extra tuition to school kids getting ready to take their A level exams. The two became friends, and when, in 1979, Boyd moved to the University’s Engineering Department to begin his post-doctorate research work and his electronics projects shifted toward more complex computing circuits, the pair decided to go into business. Branton was the software guy, Boyd the hardware man. The two found backers to provide the finance, and a company was formed, Oxford Computing, to produce and market the gadget. It wasn’t, Boyd recalls, an ideal experience - he feels the backers got rather more out of it than he and Branton did - so the two men quit and began to seek out a new project on which to work. 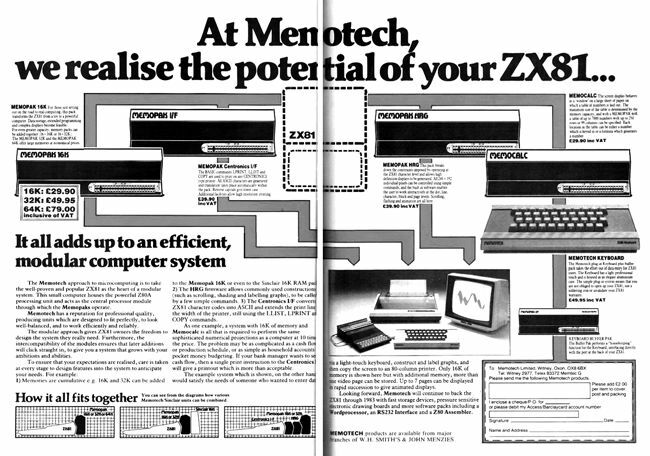 And then, in March 1981, Sinclair Research launched the ZX81. “The thing that was crucially different about the ZX81 was that it was the first small computer with floating point arithmetic. Because we were both scientists, that made a huge difference in terms of what it could do. And that’s why we got involved. We probably bought one of the very first ones, in kit form.” But the machine had just 1KB of memory, and the two partners realised that users were going to need a lot more. Boyd says he was very interested in memory at the time, having designed the memory sub-system for the digitiser. He used that as the basis for an additional memory unit for their ZX81, and so was born the first product they could make and sell rather than license. Memotech was formed, and their efforts yielded some of the first memory expansion modules for the Sinclair machine, along with Centronics and RS232 printer interfaces, and a typewriter-style keyboard, connected through the ZX81’s expansion port, for quick-fingered coders to use in place of the Sinclair-standard membrane job. The HRG masked 2KB of the ZX81’s Rom with firmware of Memotech’s own to add 248 x 192 hi-res graphics, in conjunction with Memotech Ram expansion. The company didn’t just offer hardware. Branton’s software skills were put to work producing spreadsheet and word processing applications. Memotech’s add-ons business was a huge success, and the company grew very rapidly indeed, especially when Sinclair’s own ZX81 Ram Packs were in short supply and, later, when Timex, Sinclair’s contract manufacturer, launched the ZX81 in the States under its own name. “When Dram ICs were purchased, they needed to be fully tested... which typically lasted three to four minutes,” recalls Boyd. “In the UK, there were two contract manufactures who made Sinclair’s add-on packs: Thorn EMI and AB Electronics. They used GenRad testing machines that cost over $1 million each. You couldn’t speed up the test, so the throughput of these machines was limited.